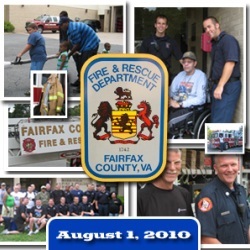 More than two dozen wounded warriors from Walter Reed Army Medical Center participated in a heavy rescue fire department demonstration at Fairfax County’s Firehouse 30 in Merrifield, Virginia on August 1, 2010. 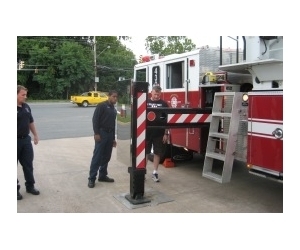 The modern fire fighting equipment rolled out for the wounded warriors (WW) allowed them to participate in orientation and operating selected items. 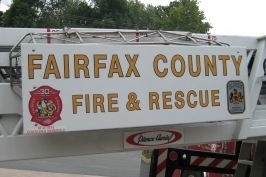 Following the demonstration, Firefighters from A shift cooked up a great BBQ for the WW and more than 30 Firefighters participating from Firehouse 30 (The Host), Firehouse 18 (Falls Church’s Jefferson FH), and Tyson’s Corner 29, the sister company to 30. 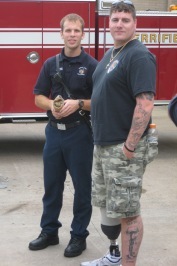 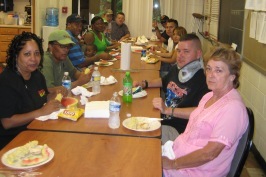 Shift Captain Todd O’Brien organized the equipment demonstration and BBQ for the wounded. 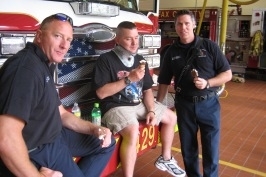 "We are no stranger to the wounded warrior program of Enduring Pride, in fact we have participated in nothing less than a dozen events with them honoring our Hero Warriors”. 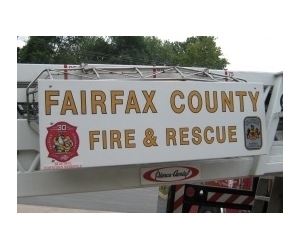 Captain O’Brien, a native of Virginia, enlisted the support of the County’s Deputy Chief and Battalion Chief for the program. 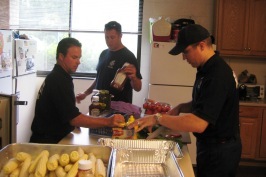 Engine, EMS 30 making the "fixins" looking good. 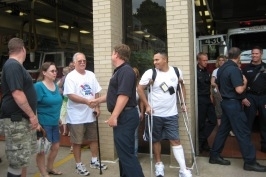 The wounded from Pennsylvania, New York State, Minnesota, and Texas also were veterans of other events conducted by Project Enduring pride, an outreach arm of the Wounded Warrior Program. 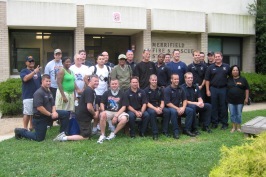 Several of the WW on the event trip were in their own right Firefighters in their hometowns. 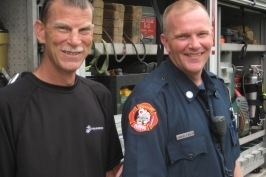 With the War in Iraq and Afghanistan calling up many Reserve Component units, a variety of community functions are also represented in the ranks, firefighting among them. 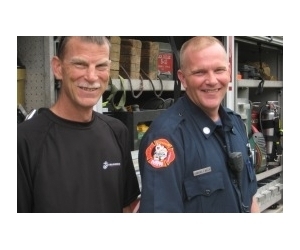 "Doc to Doc EMS, "don't go out on a patrol". 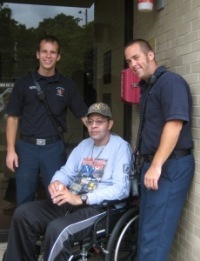 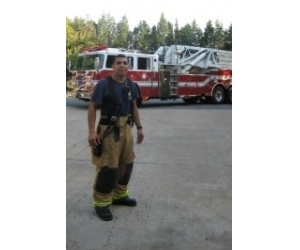 A wounded warrior from Pittstown, New York said of the day, “Back home we have good equipment and great training on it, but to me seeing the Fairfax County equipment and meeting the firefighters helped me forget what I have to go through during the week back at Walter Reed. 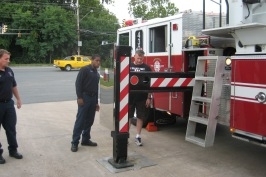 These firefighters have great equipment and excellent skills to use”. 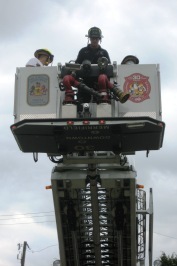 Among the equipment the Pittstown native trained with during the visit was the 95 foot Pierce tower truck. 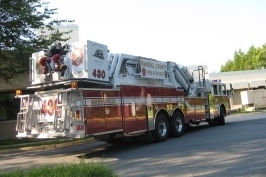 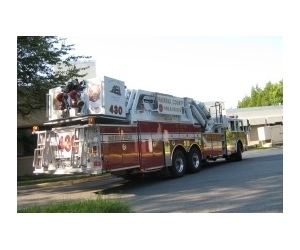 The first line equipment is staged to fight high rise incidents in Falls Church, Tyson’s Corner and structures of six stories or more. 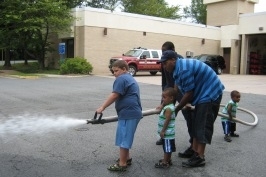 Not to be outdone, the Emergency Medical Service (EMS) was on hand to demonstrate its equipment and water hose control when “Youth” are around. 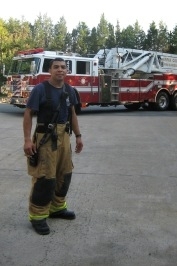 To the youngsters, the tower was impressive; however, the hose work was fun. 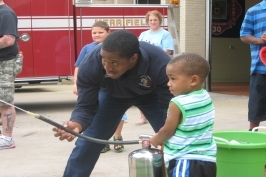 Forget that technical stuff, just give me "Hose Fun"